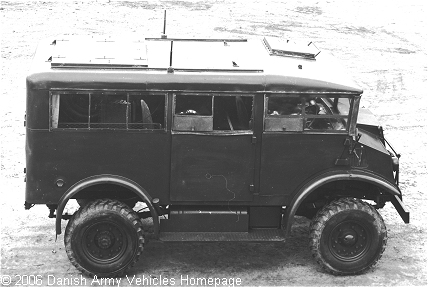 Danish Army Specific: The Chevrolet C8A was delivered from Canada shortly after WW II. Used as command cars. Used as late as the early 1970´s. Historical: Production of the C8A took place in General Motors of Canada Oshawa factory from 1942. The C8A, being the smallest type in the Canadian Military Pattern (CMP) range, was available as personnel carrier (Heavy Utility Personnel (HUP)), Wireless (HUW) and ambulance (HUA). All version used the No. 13 cab. Early models had run flat tyres and an extra side door instead of a spare tyre. The C8A had been introduced as a standardised, purpose-designed, four-wheel drive replacement for the range of modified two-wheel drive hitherto employed. When production ceased in 1945 nearly 13.000 had been produced. Length: 4.14 m (163 inches). Width: 2.00 m (79 inches). Height: 2.28 m (90 inches). Weight: 3.339 kg (7.420 lb.). Engine: GMC 6-cylinder, 3.548 cm3 (216.5 cubic inches) displacement, liquid cooled. Horsepower: 85 at 3.400 rpm. Transfer case: Single speed with front axle disconnect. without preparation: 61 cm (24 inches). Fuel capacity: 113 liter (25 gallons). Range: 440 km (275 miles).